On the BT website, it suggests that its Option 1 broadband package is "fast & reliable… cheap broadband at high speeds", and that among other things you can use it for "streaming up to 25 hours of iPlayer every month." As the BBC has discovered, Option 1 customers who use iPlayer in peak times - that is, between 5pm and midnight - can't really use iPlayer. Even if your connection speed is close to the advertised "up to 8Mbps", BT throttles video streaming in the evenings so the fastest speed you'll get is 896Kbps. In the BBC's experience the actual speed was lower still: 700Kbps, which is completely inadequate for an iPlayer session. If you aren't unemployed or self-employed, BT is choking your connection at the very times you're most likely to use it. On the subject of iPlayer's bandwidth demands BT says "We believe there is a real issue that content owners like the BBC need to address." Maybe there is, but there's an issue BT needs to address right now. Its advertising specifically says you can use Option 1 for iPlayer, and you can't. BT isn't the only ISP who does this. Many ISPs use throttling to limit demands on their network, and while we understand the reasons for it - services such as iPlayer use massive amounts of bandwidth, and bandwidth costs money - we don't like the way many of them go about it. What we need here is a little honesty. We have no problem with ISPs choking bandwidth on their budget offerings to keep the prices low, but we do have a problem with them burying any mention of such throttling in the tedious Fair Use Policy documents that nobody reads - especially when the throttling affects the very services the sales bumph is banging on about. ISPs will argue - quite rightly - that broadband services are not all the same, and you shouldn't expect the same performance from a seven quid service as you'd get from a thirty quid one. So perhaps they should stop advertising seven quid services as if they were as good as thirty quid ones. 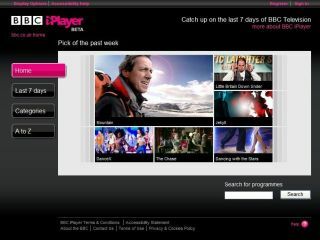 If the ad says iPlayer, you should be able to get iPlayer. No ifs. No buts. And no speed bumps.